I had an embarrassing moment a while ago. I’ve had lots of embarrassing moments, but I’ve decided to limit this post to the one. 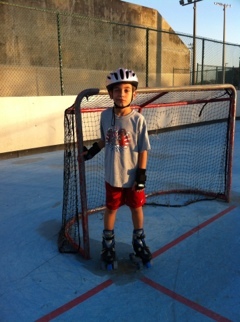 We were taking Adam out for a practice run on his Christmas skates, and I laced up mine to show him how it was done. But I didn’t get very far. Instead of gliding down the driveway, leaning into an exhilarating tight turn onto the sidewalk, and powering down the hill towards Adam and Cheryl, I did none of the above. My skates stopped beneath me just moments after I got started. Do you know anything about momentum, and if so is there a cure? There’s usually a lot of small debris in our driveway, especially this time of year, so I wasn’t surprised – as much as I might have been. However, I was surprised when my skates refused to roll with my next few steps. That’s when I noticed the new debris on the driveway: little pieces of my wheels. Damn, I haven’t gained that much weight, have I? I guess polywhatsitcalled doesn’t last forever after all – not in it’s originally molded shape anyway. Actually, the weight’s trending down these days. I felt it was important you know that. Obviously, the catastrophic failure of my wheels ended our joint skate real quick. My enthusiasm for the day crumbled faster. I’m like a little kid that way. I was looking forward to one thing and nothing else measured up. Plus, there was my poor boy Adam to think about. Was he going to grow up skating alone? Was he going to blame me? Would he carry this disappointment – this abandonment – through the rest of his life? Would he have trust issues that would end relationships prematurely, leading to a lifetime of self-imposed isolation and loneliness? So you know what I HAD to do. I got a new pair of skates, which itself is an unusually long story. Unusually long, you ask? Don’t you dare laugh. Fast forward to this weekend. Adam and I have had a marvelous time skating around the neighborhood the last couple weeks, and all of my fears for Adam’s future have subsided. But I was getting a little too comfortable – a little too confident in my skillz. After an abbreviated yet marvelous skate on Monday, I was waiting outside while Adam went in the house to replace a newly shredded pair of warm-up pants for shorts. I was barely moving. I was on the sidewalk. I was right outside my house in peaceful Dunedin. Now that I think about it, all the signs of disaster were right there. If only I could have seen them. First a wheel got momentarily stuck in the gap between our cement driveway and the cement sidewalk. (Damn you cement and your cursed expansion joints!) One moment I was waiting patiently for my son… the next I was doing the “loosing my footing on skates dance.” It’s not a catchy name, but we’ve all been there, right?If you haven’t, you’re probably lying. But if not, then picture a guy with a tall furry hat dancing at an eastern European wedding. Time slowed down as I saw all my dignity flash before my eyes. Then time sped back up, I fell heels over head backwards, and threw my hands backwards to break my fall – hoping there was no irony in that last thought before gravity finished with me. We know that God does have some sense of humor because children always catch us in these (hopefully) rare moments of excellence. Adam, as your parent I feel obliged to tell you sixty-seven percent is not a passing grade in school when you get older. I didn’t break anything but skin, but it really hurt. I did learn something though. You may never forget how to ride a bike, but you can forget how to fall off a pair of skates. That, or falling hurts more than it used to. But fear not my friends! Adam came down to meet me (sprawled on the sidewalk), and we eventually finished our skate. With one exception, it was a great skate.